For small but serious chocolate cake emergencies. According to The Stores Out There, the holiday baking season is already upon us—and we are woefully ill-equipped to handle it. We all have our weaknesses. Some girls fall prey to expensive clothes. Others own 45 pairs of totally impractical shoes. And there are those who cannot live without 'just one more' designer handbag. I lose control in the kitchenware section. This is a dangerous time of year for me. Captivating displays of shiny accessories stacked 12 feet high shimmer in the blazing glow of overhead flourescent lights. I stand there mesmerized, mid-aisle, blocking traffic, swept up into my own little fantasy world full of all the Wonderful Things I could make if only these items were part of my culinary arsenal. They beckon to me. And then they begin to look vaguely familiar. I'm knocked out of my mouth-watering reverie by the realization that I bought half of these things last year. (Or was it two years ago?) They're sitting, never used and, until this moment, completely forgotten, in the dark recesses of my pantry. Everyone knows that it's difficult to rationalize buying more of whatever it is you desire when you don't even use what you already own. There are, of course, sneaky ways around this, but the virtuous thing to do is to simply put your previous purchases into action. This means, though, that you must have the knowledge, not only of their existence, but of their location in your home. I'm not real good at this part. I'm constantly amazed by the things I come across tucked here and there that, at some time or other, I bought (and obviously thought I needed). And so it was with great surprise that I recently found myself assisted in this area by yet another of my weaknesses. I was in a state of Chocolate Cake Emergency. Unlike a generic chocolate emergency—when anything from a Snickers Bar to a spoonful of fudge sauce will do—nothing will cure this one except a piece of chocolate cake. I wrote all about this condition in this post, which also includes a lifesaving recipe. Usually in a situation like this, one loses all ability to think clearly. Actually, one loses all ability to think of absolutely anything except getting one's hands on some chocolate cake. But the other day was different, and I must give credit to The Chocolate Force. It is out there, and it is real. Its influence usually has me frantically tearing into a bag of chocolate chips and practically pouring them down my throat because they are the quickest source of chocolate I can get my hands on. But not this time. I already had my simple Emergency Chocolate Cake recipe and my newly purchased (not on impulse) electric hand mixer at the ready. But I was craving more than just a plain hunk of cake. Suddenly I remembered the mini muffin pan still in its original wrapper in the pantry. Then while blindly grasping around the cupboard for the cocoa powder, an unopened package of mini muffin papers decorated with cute little flowers jumped into my hand. And when it turned out I had extra cake batter left after filling the muffin pan, I walked straight over to yet another never-before-used pan languishing on a dusty shelf in the pantry. I was obviously acting under some influence other than my own. The Chocolate Force was with me. On the spur of the moment, I created a delicious new buttercream frosting and even managed to scrounge up a few tablespoons of mini chocolate chips that had miraculously been spared during some previous chocolate crisis. Ta dah! Ten minutes in the oven, and the delicious little darlings pictured above were born—and immediately shot straight to the top of my favorites list. And not only that, but when I head Out There tomorrow for a day of running around, I know that I'll be able to hold my head high and my hands out as I enter the kitchenware section. I have put my previous purchases to good use, and I have plenty of extra space in the back of the pantry. February 2012 updates: I recently came across a still new Calphalon dessert bar pan hiding in the pantry (a birthday gift from a few years ago), and it makes really cute little square cakes that—for those of you who are interested in this type of information—gives you a higher frosting to cake ratio per bite. (Makes 12 cakes plus a little extra batter). Click here to see what else I learned about this cupcake batter after making six batches of it in three days. This is the same recipe I used to make my Emergency Chocolate Cake; I just baked it in different pans and added frosting. 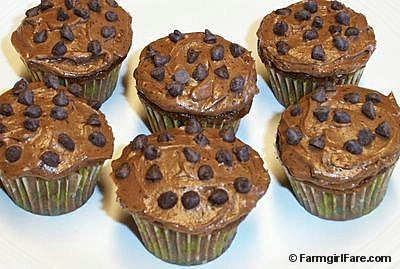 The frosting does add a little extra work, but you could always make it ahead of time (perhaps a double batch), keep it in the fridge or freezer, and just spread individual cupcakes with frosting as necessary. You can omit the espresso powder if you prefer plain chocolate buttercream. I think these taste better the next day; the cake has more flavor, and the frosting is mellower, but you can eat the cake warm if you need to. 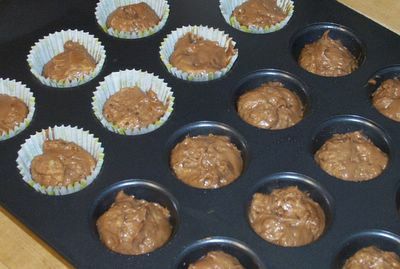 The mini muffin cups measure 1¼" across the bottom, 2" across the top, and are about 1" deep. 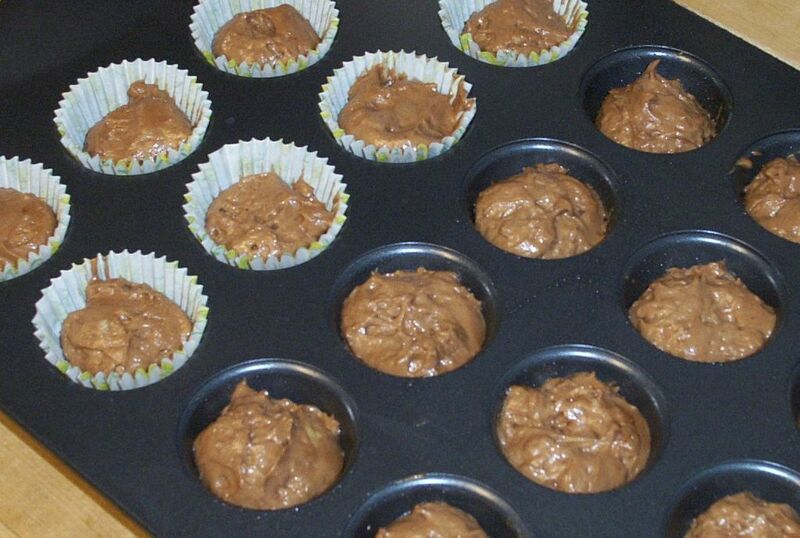 The cake batter is thick, so I used a stainless steel cookie scoop to fill the cups, and it worked really well. As you can see, I also baked some without the paper liners. I wasn't sure if the cake would stick to the papers or not. They didn't stick at all, and they came out taller and cuter using the papers. Although this is a nonstick pan, I greased the cups without the papers; they popped right out. Not quite as adorable, but just as yummy. This recipe made 24 mini cupcakes and three of these baby loaves. They measure 3½" x 2½" and 1½" deep. Serves one to three, depending on size of emergency. Heat oven to 350 degrees. With an electric hand held mixer, cream butter and sugar 1 to 2 minutes. Beat in eggs one at a time. Beat in vanilla. On medium low speed, add dry ingredients to creamed mixture (you can combine them first but I never do), alternating with yogurt. Beat just until smooth. Turn batter into prepared pans. Bake mini muffin size 10 minutes and baby loaf size 15 minutes, or until a toothpick stuck in the center comes out clean. Bake standard size cupcakes about 17 minutes. Do not over bake. Cool in pan. 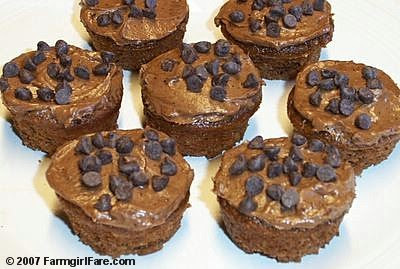 Frost cooled cakes and top with mini chocolate chips or sprinkles if desired. Melt chocolate chips and a small dab of the butter (just enough to help stir the melting chocolate chips) in the microwave and stir until smooth. In a small bowl, beat remaining butter and powdered sugar until smooth. Beat in vanilla, then cocoa powder, espresso powder, melted chocolate, and enough milk (or coffee) to make desired consistency. Can't live on cupcakes alone? You'll find links to all my sweet and savory Less Fuss, More Flavor recipes in the Farmgirl Fare Recipe Index. 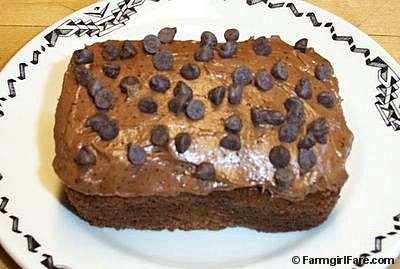 © FarmgirlFare.com, the chocoholic foodie farm blog where we sometimes eat chocolate cake for breakfast. Holy yumminess!! 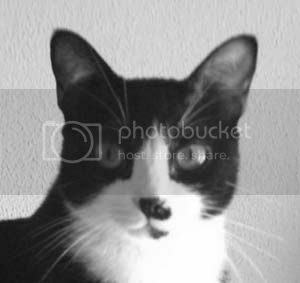 I would love one of these on Thursday, the day I claim my own babycakes, Cashew. I totally agree with Amy - the chocolate force is so funny, but I don't for a second doubt the truth of the force! I don't like chocolate myself (I know - let the gasps of shock and awe begin) but I was scrolling past these pictures when my husband (who does like chocolate and is somewhat deprived by my lack of chocolate baking) walked by and saw them. He stopped short and asked, "Wow, what was that!?" Chocolate force indeed! It's gotta be as strong here as it is there! I have to go make my chocolate cake now... and devour it too. No wonder I have had a hankering for cake! It's all your fault Susan!! sheesh! LOL Have a great day! I have to admit when I saw the title of the post, I thought to myself they decided to name the sheep Babycakes? Thank you, thank you! Last year I bought on sale a bunch of silicon baking pans, including one that is tiny torte shapes. Then all summer I didn't bake. I forgot I had them. They might have all gone to silicon heaven without your timely reminder. I went to Eurochocolate in Perugia Sunday to buy my annual 2 kilos of Valrhona select dark. I am ready! Mmmm.. those look yummy. I think I will try them when I get my next chocolate deficiency emergency. I belive they will be a nice cure. I am intimately familiar with the Chocolate Force. In fact, in a mini chocolate emergency just this morning I had to open the designated Hallowe'en mini O'Henry bars and conmsume at least 6. Luckily the whole household has inherited this malady/addiction, which may just mean Chocolate babycakes for dessert tonight. Thanks for the recipe. Thanks for the enabling. those look almost as good as the cakes I baked you this morning to send you as a bribe. (I have your address). But it looks like you already have so many, and I don't want to be blamed for any weight gains on the farm or anything, so I'll just keep them here and share them with my needy colleagues instead. Okay, that's it. I'm never ending the Name That Sheep Contest. My life will be too empty without your incredibly witty (and hysterical) comments. Yellow 21 is just gonna have to live with that name for another coupla years. At least. Glad to know you're already aware of the amazing power of The Chocolate Force. I don't even bother trying to fight it. That or you've managed to set up some kind of deflector field around your body that causes all chocolate cravings and other Chocolate Force related behavior to end up hitting your husband. Oh, I'm sure you will be able to find all KINDS of gadgets to cram into your kitchen! Oh, I didn't eat all the Babycakes myself. I shared one with The Doodle. P.S. Hey, don't go blaming me for your chocolate cravings--it's The Chocolate Force. Re 'all my fault' please see the above P.S to Clare. Wow, that would be some expensive soup. I love drooling over the Williams Sonoma catalog, but there seems to be a problem with the delivery. I call and request one, and I receive one. I find all kinds of things that, if I only owned them, would make me a much happier girl. Then, unlike every other catalog I could care less about, I never get another one. I have a feeling Joe keeps calling and requesting that my name be dropped from their mailing list. Why thank you so much! Yeah, I figured it was about time I put some food on my food blog. Welcome to the farm! Of course I'm no medical expert, but I can definitely say without hesitation that I felt much better after having had a few babycakes. Wait! Wait! My babycakes are, um, all gone. Weight gain is not a problem (they're small, remember? ), and I sincerely doubt that your colleagues are needy. You probably shower them with homemade goodies all the time. *sniff* Meanwhile, I don't even have any colleagues. How much... is a cup! lol.. Welcome to the farm! I'm glad you like the looks of my cupcakes--just wait until you taste them. Hopefully someday the U.S. (and I!) will actually learn the metric system. In the meantime, thanks to Emma (who is British) at Modern Girls Kitchen I just discovered this wonderful site which gives all sorts of Cooking Measures & Conversions. I also checked my measuring cups. One 'cup' is 8 fluid ounces/250 ml. Our butter comes in 4-ounce sticks; 1 stick of butter equals 1/2 cup. Hope this helps! Thanks for taking the time to write. If you do try my recipe, I'd love to hear about it. Yep. it´s a strange ting with those different measuring systems.. my first thought was ..a cup.. right.. a coffeecup.. or an even bigger cup.. who knew? ;) LOL..
Hi FarmGirl! I'm avid reader of your blog, which I found through a Portuguese gardening blog. Each day I come here and delight myself with your wonderful pictures and stories. Tonight I decided I should delight myself with one of your recipes also. And what a delight indeed! Best cupcakes I've ever made, even without the frosting!Thank you so much for this yummy recipe and keep them coming! Just made it and is scrumptious!! Chocolate emergency cake-definitely yes, but am going to tweak that label a bit and file it away as 'PMS cake' ;) Was'nt keen on frosting it, but did anyways, and I must say your choco buttercream frosting and the cake complete each other! Thank you for a zero hassle, keeper of a recipe. Absolutely awesome!!! I loved them!! I did not make the icing, but the actual cake...wow! !